The guard stopped. He could have sworn he heard something… He wasn’t alone. He perked his ears and began to scan the room. Another noise, “I know you’re around here-“ …the blade slid across the guard’s throat with ease. Corvo set the body down slowly. “Somewhere…” He said with a smile underneath his mask. As Corvo wiped his blade he thought to himself, ‘That would make a great intro’. 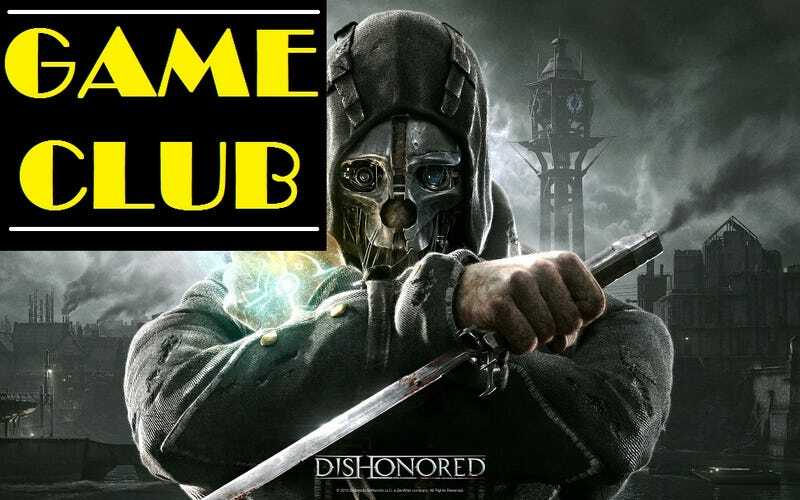 Welcome to Game Club: Dishonored – Part 4. Alright, ya chokin’, stabbin’, blinkin’, possessin’, time stoppin’, bolt shootin’ bunch. I hope you’ve all had a great week and managed to get some Dishonored play time in! It was hard for me, seeing as GTA V came out, but I managed to dig in still and complete our two missions that we’ll be discussing this week: “Return to the Tower” and “The Flooded District”. Now, let’s cut off some fat so we can bite into the meat. As usual, would you kindly not spoil anything past our checkpoint for this part of the Game Club? So, that means no talking about things that happen after “The Flooded District”. Thank you much. Spoilers Ahead! Let me say, these are two excellent missions. I’ll dig in to why I loved these missions in a minute, but first a little exploration. I kind of forgot that I had sort of been to the tower before. So when Samuel was taking me toward the entry with his boat I looked at it like a whole new area. It wasn’t until I was almost inside the main building that I realized this is the first place you go in the game. I returned from a long trip here, I played hide and seek here, and I watched the empress… the mother of my child… die here. Normally when a game returns me to a location I’ve already been, unless it’s an open world game (I don’t consider this game open world), I feel like it’s a lazy move; an old trick of the trade of saving some time instead of creating new assets and designing new levels. This time around I did not feel that way. This was the perfect way to return to this location. If I hadn’t seen the mission list before starting my playthrough I would have assumed this was going to be the climax, the big finale where the story goes full circle. The best part is that it does come full circle, but with a twist. Mmmm twists. This level finally gave me the “million ways to do things”. As soon as Samuel’s boat landed I looked up and thought, ‘this is the playground I’ve been waiting for’. Just like the mission “The Royal Physician”, this area let me play with the up and down as well as the side to side. Every level does that on some level, but this level is perfection in that regard. I went for a full on sneak through and it started out pretty well. I did end up having to knock out a few guards (and kill one loud mofo), but for the most part I managed to get to the main building without a single issue. I felt good, proud, like I had mastered the games mechanics. Once inside I immediately sought after the non-lethal option. It hadn’t been revealed yet, but I figured it had something to do with the broadcast tower. I get to the door and… locked! Dammit. So, I looked for the key… FOREVER. I took out every single guard in the building and accidentally (yes, it was a mistake) killed the general. Whoops, oh well. Still, no key to be found anywhere. Where the hell is it? So, I do this dramatic slide into the target’s chamber and he sees me immediately and runs away. Great… I continue my search for the key and eventually find the other door into the radio tower and just go in that way annoyed that I had spent so much time looking for the key. Bingo bango bongo, I have the incriminating message play and he’s taken away. A quick mad-dash to the boat and I’m golden. Great mission. The boat ride back was eerily quiet. The way Samuel spoke was somber and his words of celebration made me uneasy. Oh no… this is it. I figured a twist was coming (I haven’t trusted Lord Pendleton the whole time for some reason), but I didn’t think it would be like this. I celebrated and went to talk to Emily… there it is. Poison. I’m saved by Samuel (reason number one thousand I like him), and I’m soon held captive by Daud and his teleporting cronies. Good Things: The set up and wind down of each level when you are slowly trolling in Samuel’s boat is great. It gives you a chance to prepare and compose yourself and you get a good view of the world these characters inhabit. Each mission has been set up with this, so when you finally come back after taking down the Lord Regent there is a subtle undertone I could feel immediately. I felt like it was the last time I was going to ride in Samuel’s boat. The twist was decent enough to get me excited about the game’s story again. Now I feel like I’ve been wronged, and now I feel like I have something I need to do. The many ways to approach a level is finally a lot more visible to me. You can literally do the mission “Return to the Tower” a thousand different ways and I could see the possibilities. Totally a playground. I love that you can look through the keyhole of a door. It’s not that I just noticed or just started doing it, because I’ve been doing it the whole game, but it’s a cool mechanic. It makes stealth in the first person so much more doable. Billy Lush does a great job as the voice of The Outsider. Bad Things: Very few complaints this time around. I still have similar complaints that I’ve had in the last parts, but that horse has been beaten to a bloody pulp. If I had to find some things, though (and I should), I would say I think “The Flooded District” is a little weak. I wasn’t having as much fun as I was in the mission before it. It could also be that I wanted to play GTA, but maybe I’m not alone in the thought of it being one of the weaker missions. I hate the barnacle things. They’re not that difficult to deal with or get around; I just hate them in terms of design. Why are they there? I get it, Dunwall is seaside and the plague crap does weird things to people, but the barnacles and weepers just seem so… weird and unnecessary. Like, they had a meeting and were like, “we need some more enemies, guys”. I don’t know, it adds some variety, but I just find them to be a nuisance and I just bypass them anyway. I could do without them. In the cutscene where you have the poisonous ‘celebratory drink’, Lord Pendleton hands it to you. Or rather, he sticks out his hand with a glass in it, a glass appears in your hand, and then the drink in his hand disappears. Maybe mine glitched out, but that looked like crap. I refuse to believe they couldn’t have made that look like it was not a cutscene from 2003. Hell, that little moment may as well have been taken from Goldeneye or Perfect Dark or something. Okay, got it out… All better now. We’ve reached the home stretch for Dishonored! For next week complete the final two missions: “The Loyalists” and “The Light at the End”. These are due on Thursday 9/26. Next week we’ll have a discussion about the last two missions as well as wrap things up for our first Game Club. So, we’ll be able to talk about the game as whole as well as specific missions. Thanks to all who have been playing along or reading along and commenting! Let’s wrap this thing up next week in style. Okay fellow Corvos, what are your thoughts? What do you love? What do you hate? What do you want to talk about? Let’s kick it off! And, as always, thanks for reading and playing along!